As most of you know (most here cause there might be someone out there who does not know) Christmas (Xmas) is just around the corner. I see most of us getting into the holiday spirit now. 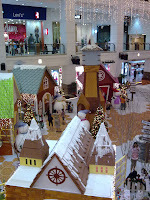 Some of you might have already visited a couple of shopping malls and seen some xmas decorations. 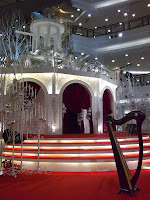 For me, I've visited The Curve, One Utama, Midvalley Megamall, Tropicana City Mall and Berjaya Times Square (TS). As you can see on your right, it's at the concourse of TS. Actually there's a stage further right in the picture with a bigger structure on top (house/barn like). 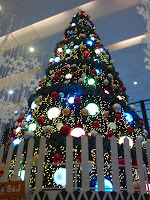 After entering through the front entrance of TS, you will definitely notice a humongous rotating xmas tree. Yes, it's the tree used every year for xmas but this time with a twist... it's rotating. Below the huge tree is a hut/shack, S&J had the honor (or money) to be selling their stuffs below the tree. As you can see from the xmas tree picture, you will notice there's an S&J signboard. Upon entering, you will get to listen to the creaking rotating sound of the tree above, if your ears are sensitive enough. TS also prepare some pictured board there with faces cut-off so you could put your face there and get the body of Santa... and take pictures. You will get to see roaming Santa and his... errrr... wife? While for 1U, it's more of a classy xmas. Look at the glass like structure, the top part is rotating. This is the only part that i felt xmas spirited, elsewhere was just simple deco. Even though it's with the classy look, it's free for anyone to take picture. Tropicana City Mall got all the xmas stuffs put up for sale on the concourse but not much xmas decorations. Maybe they are still preparing. While for Curve, they've prepared a place for you to take pictures. It's a nicely decorated xmas stage like place. I forgot to take picture of that place and it's really hard to describe. Me myself? My family has setup a Xmas tree in our living room. Not a big one, it's height is up to my torso. It's nice, very nice. It's the tree me and my friends bought for xmas few years back... can't remember exactly which year. I still remembered how we celebrated the 1st xmas we had that tree. BBQ + Steamboat dinner... at my house. yaya. i rmber. i did join the BBQ + Steamboat at yr hse too rite? can I "like" this post?? :) I am definitely in da mood now..and pls sign in your gmail..there's some plan running on..:p don't miss out yea..
i know... i spoke directly to litheen bout the plan. Can't make confirmation now.